Offering the best BBQ and hassle free catering since 1978! Start the day off right with breakfast catering from David’s BBQ, Gainesville’s best-kept breakfast secret! From a quick breakfast sandwiches to made to order omelets David’s mouth-watering breakfast is sure to be a crowd pleaser. Choose from pick-up, drop-off, drop-off with full service, or cooking on site catering services. Our breakfast sandwiches are perfect choice when you don’t have time or space for a full breakfast buffet! We will make them fresh for you to pick up or we can drop them off at your location! The breakfast sandwiches are good alone, but some grits or tasty Canyon Cubes (seasoned breakfast potatoes) will make them even better. Are you looking for a full service breakfast buffet? David’s will can set up a full serving line including items like eggs, bacon, sausage, grits, potatoes, fruit, biscuits, French toast, and some of the best orange juice you can find. Feel like splurging on breakfast for your next meeting or event? David’s BBQ’s made to order omelets are an excellent choice. With this setup you get everything that comes with the full service breakfast buffet, but instead of bringing scrambled eggs we bring our very own omelet stations. Your guests can place an order with our chefs and while their omelet is cooking they can help themselves to the delicious buffet. Choose from several tasty omelet ingredients like bell peppers, mushrooms, onions, breakfast ham or cheese! If omelets aren’t your thing, we can make any style of eggs when we bring these burners. Whether it’s an office party, corporate event, birthday party, picnic, or graduation party, let David’s BBQ take care of breakfast. Our hassle-free catering has all the ingredients to make your event a success! Ready to order? Please contact David’s BBQ at 352.373.2002 and ask to speak with the manager or catering coordinator. 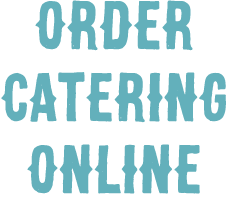 Or you can conveniently place your catering order online. Subscribe to our mailing list for a $5 off coupon on your next order! Get Social, Follow Us Below!